YouTube is a great video-sharing platform on which people can upload and watch videos on all matter of topics. Here you can find videos of tutorials, reviews, entertainment, advertisements, or any other purpose. But using YouTube requires that you are online – YouTube doesn’t offer a direct download option for video lovers. Fortunately, people out there can use video downloader tools like Gihosoft TubeGet to save their favorite YouTube videos onto their computer to watch later. What if you don’t want to install third-party programs on your computer? Browser extensions and plug-ins can also do the download work for you. There are a number of YouTube video downloader Chrome extensions when it comes to downloading videos from YouTube using Google Chrome. In this article, we’re going to introduce you the 4 best Chrome extensions that you can use to download YouTube videos for offline viewing. Want to download videos that is available on the page? You can try Video Downloader Professional. It is one of the most popular YouTube video downloader Chrome extensions. Once you’ve install the plugin, it will add an icon in the toolbar next to the address bar. And the icon will turn green if it finds a downloadable video on the active page. If you want to save the video, just click on the extension icon and you will get the complete list of all the videos that can be downloaded from that page. Also, it shows the video format, file name and video size to be downloaded. FastestTube is another great Chrome extensions to download YouTube videos which offers brilliant stuffs to its users. You can use this extension in most standard web browser like Internet Explorer, Safari, Firefox and Opera, other than Chrome. It is not available on Chrome web store, but it is still easy to download and install. After adding this extension, you will find a Download option whenever you open a video in the browser. Then you can download your favorite videos from YouTube hassle-free. Same as the above-mentioned FastestTube, YouTube Video Downloader is an extension compatible with Chrome, Firefox, Opera and many other browsers. And it is not available on Chrome web store, too. You should head to the extension’s website to download it. After you’ve added this extension to Chrome, you will see a green download button next to the subscribe button on YouTube’s interface when you open a YouTube video. In a word, YouTube Video Downloader extension makes it really easy to save videos from YouTube for you own use. Last but not the least, Flash Video Downloader is another helpful Chrome extension to download videos from YouTube. The extension adds its icon to Chrome’s toolbar when you install it. The icon in the Chrome toolbar remains gray by default. It will automatically turn blue when it detects a downloadable video in the active page. 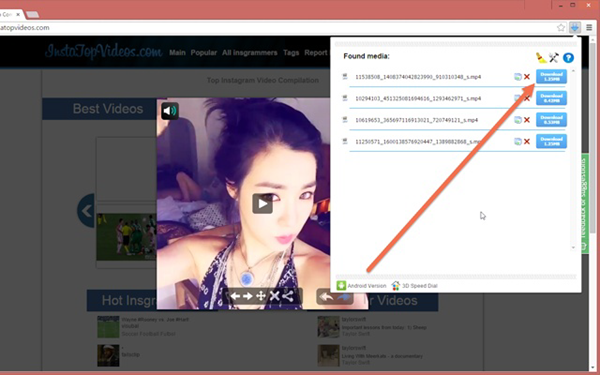 Just like other extensions mentioned in this list, to download the video, you can simply click on the blue extension icon and it will bring a drop-down window which shows the found media files and their quality. This YouTube video downloader extension is able to download 4K videos from YouTube, as well as Full HD, MP3 etc. Now we’ve covered the 4 best Chrome extensions for downloading and saving YouTube videos without having to install anything on your computer. All these extensions are guaranteed to work well. Here we will take Flash Video Downloader extension as example to show you how to download YouTube videos in Chrome step-by-step. Go to Google Chrome web store and search for “Flash Video Downloader” extension. Click “Add to Chrome” then choose “Add extension” from the pop-up to add Flash Video Downloader extension to your Chrome. No matter if Google permits or not, videos can be downloaded with ease by using these extensions and plug-ins. If you want to download the videos in a legal manner, then you can buy the YouTube Red account for which you have to pay $9.99 as the subscription fee. But you can save these bucks if you use these extensions If you are using some other extensions for the downloading purpose, then please let us know in the comments section below. Also, you’re welcome to discuss the issues you encountered during the using of these extensions. We will try to resolve it and give you the possible solution for that.